The website of “NewGNI” has not resolved to a server for days. The “program” is believed to have been a knockoff of a predecessor scam known as “GNI” or GoldNuggetInvest, which collapsed in early 2010 after being promoted by members of the AdSurfDaily Ponzi scheme. Among the pitchmen for both GNI and NewGNI was Ponzi-board legend “Ken Russo,” also known as “DRdave.” Earlier, “Ken Russo” had promoted the $119 million ASD scheme. He later turned to ClubAsteria, which was trading on the name of the World Bank to reel in suckers. ClubAsteria promos came under the lens of CONSOB, the Italian securities regulator. 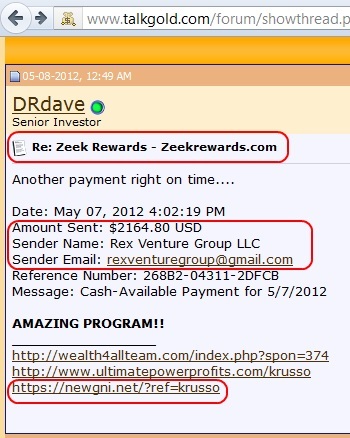 “Ken Russo” also emerged as a pitchman for Zeek Rewards, which the SEC described in August 2012 as a $600 million Ponzi- and pyramid scheme operating from North Carolina. Among “Ken Russo’s” latest ventures is “Profitable Sunrise,” now the subject of a cease-and-desist order from North Carolina regulators. Profitable Sunrise purportedly is operated by Roman Novak. The “program” is being targeted at people of faith, some of whom appear to be defending it by weaving impossible tales. Any number of Ponzi-board taunts have been aimed at the Securities Division of North Carolina Secretary of State Elaine Marshall, even as ProfitableSunrise advertises a risk-free, preposterous return of 2.7 percent a day in its bizarrely named “Long Haul” program with a purported Easter holiday payoff. “lol @ NC officials,” says one post at MoneyMakerGroup. Another compares Marshall’s office to “Deputy Barney Fife,” an iconic TV character played by Don Knotts in the Andy Griffith Show. Even after the government of Belize issued a warning against GNI in 2009, scammers continued to promote it — virtually to the very day it collapsed and took an unspecified sum with it. The collapse triggered a bizarre series of conspiracy theories. GNI was operating concurrently with a now-collapsed scam bizarrely known as “Cash Tanker,” an “opportunity” aimed at Christians. Cash Tanker used an image of Jesus Christ in its promos and purported to pay 2 percent a day. A little while ago they announced they were ‘closing the doors’ to new members. I knew then that it was the beginning of the end. When you see the words ‘closing the doors’ it is ALWAYS a way of pulling in as much cash as possible before they close the doors for good – usually a short time after. This is now so predictable it is boring. Didn’t they declare this was going private back in December, which is what the original GNI said which was the kiss of death for it? Yes, which is what I meant by ‘closing the doors’ to new members. You are right. Almost no adjective is strong enough.